The current edition of ONE contains the hope-filled story of how Caritas Ukraine — with support from CNEWA — is offering the elderly poor a Window to the World, giving new life and possibility to some of the country’s neediest men and women. They have contributed more than a half million dollars to implement a program in Ukraine similar to one in Canada: Medical equipment is purchased for Caritas, which in turn lends or rents it to the elderly. Family members then are shown how to use walkers and other life-easing equipment with their older relatives. We have known Anastasia as a generous person who strived to make the world a better place and who succeeded in changing many hearts. Being a Ukrainian Canadian, she cared particularly about the marginalized people of Canada and Ukraine; however, her generosity knew no geographic borders. During her fulfilling life, she championed the principles of social justice and spent enormous amounts of personal time and resources to help victims of discrimination. In 2013, together with her husband Dr. Jim Kingham, she established with CNEWA Canada a special endowment fund to support social justice projects in Ukraine. A modest woman, Anastasia refused to have the endowment named after her. This year, the endowment will start continuously supporting the charitable initiatives of Caritas Ukraine. One of these projects will be lending medical equipment, free of charge, to poor people with serious temporary and permanent disabilities. The legacy of Anastasia’s writings, actions and of her sacrificial love will continue transforming lives in many countries. You can read more about her remarkable life in this tribute*, on the website for Ukrainian Catholic University. 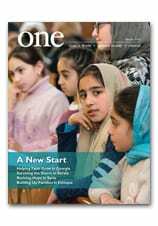 To discover more of the good fruits of the Kinghams’ generosity — and the generosity of so many others around the world — read Windows to the World in the December 2018 edition of ONE.